Maker of handwrought flatware, holloware and jewelry in the Arts & Crafts style. In the partnership of Cook, Porter & Co. with George Washington Porter and Selden Cook 1848-1850. Later partnered with William H. Wheeler as F.W. Porter & Co. 1854-1875. Went by H. Porter & Co. 1830-1840. Utica, NY after 1811-1837 and 1850-1862. In the partnership of Porter & White with Philo White 1808-1809. In the partnership of Barton & Porter 1811-1816. Partnered with Richard Huntington 1817-1837. Sold his business in 1937 and worked as a merchant. Worked again as a silversmith and jeweler 1848-1862, first for H.S. Bradley then on his own again in 1850. Horace E. Potter and Gurdon W. Bentley. Succeeded by Potter and Mellen, Inc. Founded by Horace Potter and Louis Mellen. Successor to Potter-Bentley Studios. Their long-standing retail store closed in 2008. 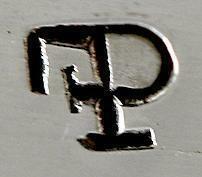 The lower mark shown to the right is used on gold. Succeeded by The Potter-Bentley Studio. Well known maker of handwrought sterling wares in the Arts & Crafts style. Founder of the Potter Shop 1908-1915 and Potter Studio 1915-1928. Was in the partnership of Potter-Bentley Studios with Gurdon W. Bentley 1928-1933 then in the partnership of Potter and Mellen until his death in 1948. John O. Potter and James R. Potter. Was in the partnership of Potwine & Whiting with Charles Whiting c. 1761. Worked with his son Henry R. Power under the name of H. Power & Son 1848-1852. In the partnership of Pratt & Beard in Chillicothe in 1828. In Cincinnati, he was a partner in the firm of Pratt, Stretcher and Beard 1828-1829; Stretcher leaving the firm in 1829 to become Pratt & Beard, but the business was dissolved later that year. In the firm of Wm. Pratt & Brother 1844-1849. Went by W. Pratt & Co. 1855-1873. 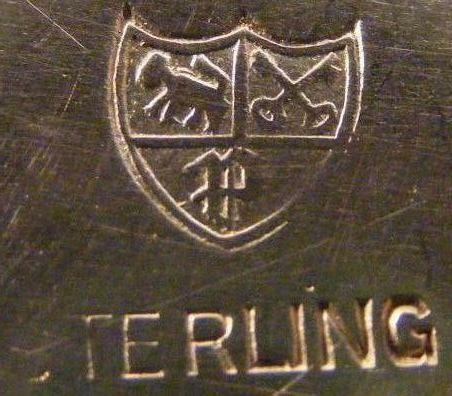 Makers of sterling and silverplate holloware. Went out of business in 1990. 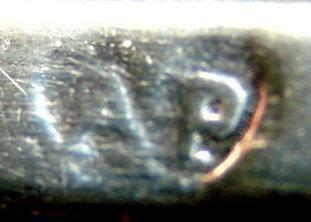 Makers of sterling and silverplated cigarette cases and other small items. Formed a partnership with his son George L. Preston as L.W. Preston & Son 1878-1882. Had a branch store in Fair Haven, VT.
Was in the partnership of Prevear & Harrington with Samuel Harrington 1841-1842. Succeeded Edward Prill, Inc; became Prill Silver Co. c. 1940. Makers of sterling and silverplated holloware. In the partnership of Campbell & Prior with John Campbell 1834-1836. Upon Prior's retirement in 1887, his son took over his business as Warren Prior & Son. Prouhet & WittSt. Louis, MO 1857-1862 and 1865-1872 Hyppolite Prouhet and Thomas D. Witt. In the firm of Prouhet & Witt c. 1857-1862 and again 1865-1872. Silversmith and watchmaker. Became a part of B.M. Shanley, Jr., Co.
Was in the partnership of Lanphier & Pryse in Washington, DC, c. 1827-1829. In the partnership of Foster & Purple 1844-1845. In the partnership of Putnam & Low with John J. Low 1822-1828. Partnered with William S. Wright as the firm of Wright & Putnam c. 1836.